Henry Tonkinson Jamieson was born in Edinburgh in 1885 and was to become a first class athlete who won two Scottish championships. Educated at George Watson’s College and then at Edinburgh University where he graduated as a CA , Jamieson had very short athletics career with mst of his running done in and around the capital. His father William Keir Jamieson was a fruit merchant who died in 1890 aged only 34. Henry was only five years old at the time and was sent South to live with his wealthy aunt in Sunderland, returning later to start his education at Watson’s. ” 1. HT Jamieson; 2. T Welsh. Time 4 min 48 sec. T Jack who finished third led practically in the first three laps but on entering the last lap, Jamieson went to the front, closely followed by Welsh. The race was then left between these two. Welsh made a strong effort at the last bend but Jamieson kept his lead and won by about six yards.” Jach went on to win the three miles title. Three days later, on 20th June, he avoided the Heart of Midlothian Sports in favour of the Inter-University Sports at St Andrews which were held on ‘the beautiful recreational park which was gifted some years ago to St Andrews University by their late rector Mr Andrew Carnegie.’ This time, his third race in seven days, he did not come out victorious. The race was won by G Twort of Aberdeen in 4:47.6 with A Gray of Aberdeen second and Jamieson in third. It was only a week before the SAAA Championships. He was not quoted in the first four for the Mile. Into August and he travelled furth of Edinburgh to compete in the Celtic FC Sports in Glasgow. This was a big meeting with several Americans competing but he turned out in the open handicap half mile where he was first in 2:00 off a mark of 12 yards and reported to be ‘finishing in great form.’ To end the season he ran in an international against the Irish-Americans on 19th August. Jamieson seemed to race less often in 1909 than he had done in 1908. 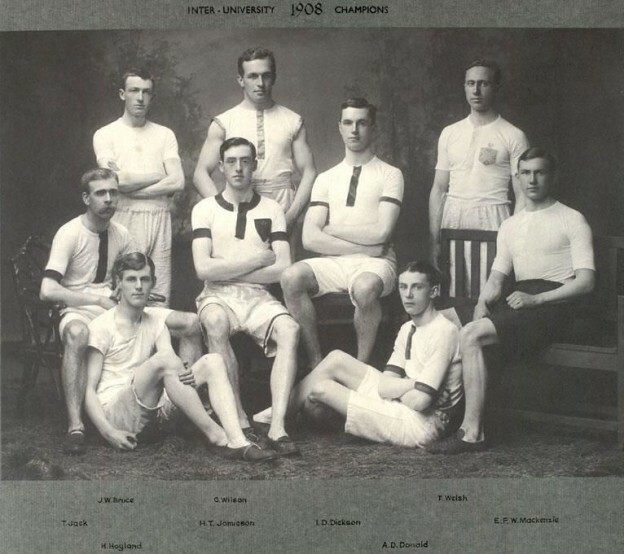 There was no appearance at all in the Edinburgh Northern Harriers Sports where he had competed the previous year, nor was he in evidence at the Edinburgh University Sports, and he was absent from the Inter-University Sports where Welsh and Gray each had a first and each had a secone in the Half- and Mile. As was the practice, he was selected for the Irish International at Balls Bridge on 17th July. The ‘Glasgow Herald’ was not in its sunniest mood when reporting on the fixture. The extract covering the Mile which featured Jamieson and McGough gives the flavour: “Had the Mile been run with the same judgment, Scotland might have recorded a point. The time, 4 min 33 3-5th sec, was quite within the reach of both Jamieson and McGough, and in addition both Morphy and Fairbairn-Crawford had previously taken part in the half-mile. Perhaps the track, which measured 3 2-3rd laps to the mile, upset their calculations, for it was quite evident that neither Jamieson, who went off at 480 yards to go, nor McGough, who tried to hold him, could sustain their effort to the tape.” The judgment referred to was that shown by the Scots in the half-mile, the point that might have been scored was that for the winning athlete (matches were determined by the number of victories recorded) as McGough finished second to Morphy. He did run in 1910 – for example at the start of June he ran in a 1000 yards handicap race at the Edinburgh Harriers Meeting and was unplaced – admittedly the first three had handicap marks of between 38 yards and 65 yards which are not inconsiderable in such a short race, while he himself was back on 5 yards. The ‘Scotsman’ did say that he made a great effort but could not raise a sprint at the finish. But to all intents and purposes his athletics career was over. The clubs? The Toronto Hunt Club was founded by the British Army officers of the Toronto Garrison in 1843, the Royal Canadian Yacht Club is one of the world’s largest yacht clubs and was founded in 1852, The Arts and Letters Club is a private club founded in 1908, the Rideau Club is ‘ the club of Canada’s ruling political elite’ and was founded in 1865, the Empire Club is a speakers club and was founded in 1903, and the Canada Club was founded in 1897 and meets to hear lunchtime speeches by local, national and world leaders. Covering horse riding, sailing, arts and letters, politics and world affairs his various memberships had no hint of any connection with athletics. “Harry Tonkinson Jamieson died on December 27th, a few days before the Club’s Christmas Dinner. Those two events, so close together, immediately bring to mind the many occasions when Harry carried the Boar’s Head in the processions at earlier Christmas dinners. His health prevented him from being at the club for the last several years. Born in Edinburgh where he qualified as a CA, Harry came to Canada before the first world war to practise his profession. He joined the Club in 1920 and immediately became involved in Club matters. In the Archives is his first handwritten audit report for 1920. Harry personally or his firm, under his direction, continued to audit the Club accounts for half a century. Jamieson was a credit to himself, his family and his education, but his battles with McGough reflected society at the time. McGough was the son of Irish immigrants who had come to Scotland to find work and escape poverty. Brought up in the Gorbals, he became the local postman and a wonderful athlete who founded an athletic club for Catholic boys – the St John’s Young Men’s Catholic AC – and continued to be involved in sporting interests such as athletics, football (Celtic and Manchester United) and Gaelic football. The comparison between these two men, both fine athletes who competed side by side for Scotland, could not have been greater, and it is one of the fine things about the sport at the time that men from such widely differing backgrounds and life styles could get together. I am grateful to Alex Wilson for much of the information used in the profile including the photographs and would encourage you to read his profile of John McGough.